Ighalo hat-trick takes Nigeria closer to Nations Cup place - SABC News - Breaking news, special reports, world, business, sport coverage of all South African current events. Africa's news leader. 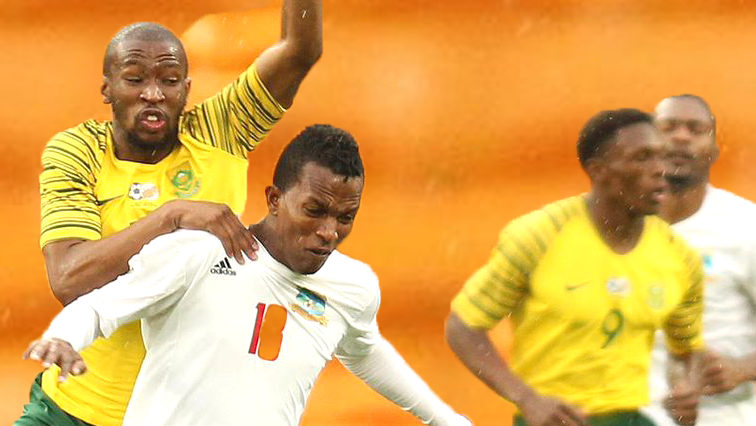 In-form Strasbourg striker Lebo Mothiba was among the scorers with his third goal in three games for Bafana Bafana, who might well have hit double figures with some more accurate finishing against the woefully out-gunned Indian Ocean island minnows. Odion Ighalo scored a hat-trick as Nigeria took a big step towards the 2019 African Nations Cup finals with a thumping 4-0 home qualifier success over Libya on Saturday as the continent big guns flexed their muscles with significant victories. Former Watford forward Igalho netted an early penalty to settle the nerves of the home side before scoring two more in the second period to go with a strike from Samuel Kalu against a Libyan side whose coach, Adel Amrouche, resigned unexpectedly on Tuesday. Nigeria leapfrog the North Africans into second place in Group E after three games, a point behind leaders South Africa, who recorded their biggest ever international victory with a 6-0 hammering of Seychelles in Johannesburg. The top two teams in each pool advance to the finals in Cameroon next June and July, and Nigeria and South Africa can all but seal those two Group E places with away wins against the same opponents on Tuesday. Everton midfielder Idrissa Gueye was among the goals as Senegal cruised to a 3-0 home win over Sudan in Group A, with Pape Abou Cisse and M’Baye Niang also on the scoresheet. Madagascar join Senegal on seven points at the top of the pool after a 1-0 win in Equatorial Guinea thanks to a goal from Faneva Andriatsima. World Cup finalists Morocco needed a 97th-minute winner from Faycal Fajr as they edged tiny Comoros Islands 1-0 in Group B, while Zimbabwe took charge of Group G with a surprise 2-1 win in the Democratic Republic of Congo. Defender Ronald Pfumbidzai opened the scoring for the visitors, who added a second via Knowledge Musona, though he was sent off with 15 minutes to play. Yannick Bolasie scored what proved a late consolation for the Congolese. Tunisia laboured to a 1-0 win at home to Niger in Group J following a first-half strike from Yassine Meriah, and also finished the game with 10 men when Ghailene Chaalali was red-carded five minutes from the end. Tunisia have a perfect record in the pool with nine points — three more than Egypt, who lost star forward Mo Salah to a groin strain as they defeated eSwatini 4-1 on Friday, ruling him out of Tuesday’s return. There were also wins on Saturday for Uganda, Namibia and Burkina Faso. This entry was posted on 14 Oct 2018,09:16AM at 9:16 AM and is filed under Sport. You can follow any responses to this entry through the RSS 2.0 feed. Both comments and pings are currently closed.